Here is a picture of two famous Haitian media personalities, Valéry Numa and Clarens Renois. Clarens Renois is primarily known to the public as a journalist. He runs an online media, the PNH (Haiti Press Network) that he founded and a correspondent of Agence France Presse in Haiti. On August 13, Clarens, one of the most respected members in the media, both in Haiti and abroad got involved in a debate with reporter Valéry Numa on a Radio Vision 2000's Guest Space Show. 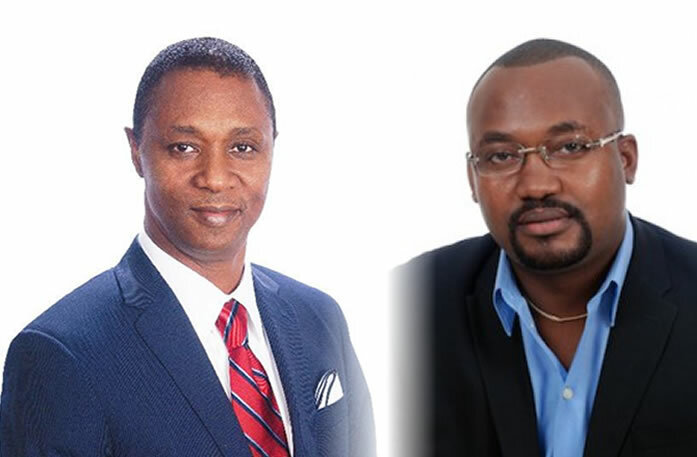 The host criticized Renois rather harshly without giving the honor he deserves as one of the most noteworthy candidates for the presidency of Haiti (from the platform of Union Nationale pour l'Integrité et la Reconciliation). He is a charming gentleman with a sensitive heart and attentive ear. His moral and ethical journalism has involved himself with Radio France International (RFI), Radio Suisse Romande, Voice of America, CNN, ABC news USA, and CBC Canada. The host of the show Valéry Numa became very much vocal about Clarens' most efforts and his initiative to form a coalition of forty presidential candidates; he even had termed that as an act of a greenhorn. However, Renois replied, you cannot put anyone's idea into the voters' heads. They will act by their hearts. And he reminded Numa, holding a microphone does never make one almighty; the duty of a journalist is not to advise but to ask questions humbly and find the answers.